I know every couple has their routine, most of which are probably very mundane and a total snooze fest. Mr. Prevention is NOT a morning person. Even after an average of 9-10 hours of sleep a night. (If you’re rolling your eyes, have eyes bugging out of your head in disbelief, or you’re picking your jaw up off your keyboard….I KNOW. ), Mr. Prevention is a total nightmare in the morning despite his plentiful sleep. I get up quite some time before him to feed the dog, drink too much coffee, and blog. I venture up to get ready about the time he’s rolling out of bed and hopping into the shower. We don’t speak…I know better than to even attempt conversation at that hour. You know, the WEE hour of 7:15am. Eye roll. When I have “my face on” and have moved on to making acceptable the hair that welcomes me in all its disarray each morning, is about the time he asks for wardrobe advice. Yesterday morning he came in wearing brown pans and a black shirt. I know that fashion says brown and black is okay, but this was so totally wrong. Then, it got ugly when he falsely accused me of approving this outfit “less than a month ago.” Dude, no. You’re wrong. That outfit is wrong…change it. And I would’ve never, ever, EVER, in a million years, told you that THAT was acceptable. There’s a lot I would love to change about our morning routine. Something to the tune of me getting to sleep in sometimes while Mr. Prevention takes care of the dog and throws on a pot of coffee (I wouldn’t even beg for a latte). Perhaps I could leave for work on time because I wouldn’t be playing Project Runway and getting verbally assaulted for my opinions. But, I wouldn’t change much about our Saturday football routine. There is nothing not to love about snuggling up on the couch with a steamy bowl of chili and watching college football…even if this season is proving to be a total nightmare, yet again, for the University of Illinois. I never lose faith and I always enjoy chili. Sauté the onion, yellow pepper in oil until softened. Add garlic and spices; cook 1 minute longer. Add the ground meat and cook until no longer pink (breaking up the meat while cooking), approximately 10 minutes. Transfer to large pot; stir in the remaining ingredients. Cover and cook on medium-low for 1 hour, vent the lid and cook for an addition 30 minutes to an hour. Result: Delicious! The pumpkin flavor was very subtle…you had to know there was pumpkin in the chili to even detect it, if even then. Mr. Prevention dipped into this while I was running during the first half of last week’s Illini game, and he enjoyed it a lot. 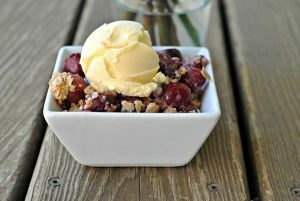 Of course he had to add some crushed red pepper, but this was a classic, thumbs up recipe with lots of protein and fiber! Enjoy! P.S.Thanks for all of your votes! 2. This chili looks fantastic! I will absolutely be making this for Sunday football. Just hoping for a good cornbread recipe (hint hint ;)). And I’m thinking of adding a touch of cinnamon to this to enhance the pumpkin flavor. Although the pumpkin probably gives amazing juiciness and texture to the chili, the thought of using a can of pumpkin and not *tasting* its amazingness might kill me. 3. Glad your review went well. As if anyone actually thought it wouldn’t! The Boy and I already have our routines…but he insists that he pick out his outfit for the day by closing his eyes, reaching into his drawer and picking whatever he grabs first. Arrgh. This chili sounds amazing…I love the pumpkin infusion! My husband is impossible to wake up too. 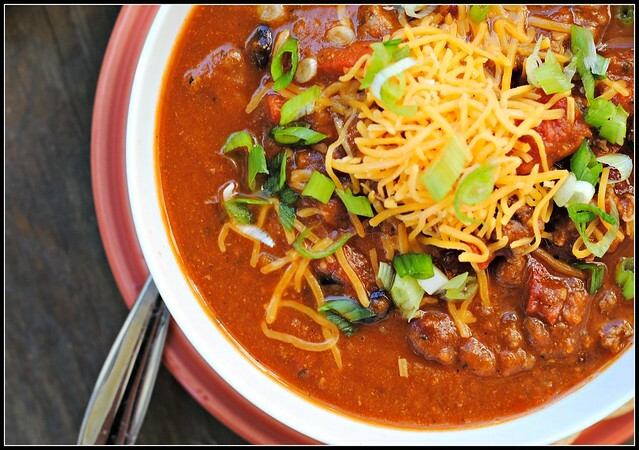 I love the chili season and oh my goodness does this look amazing! I had to laugh because the first part of the post could have been written by me. I get up at 6:45, make coffee, empty the dishwasher, write my blog, walk the dog, pack my gym bag, take a shower, dressed and put my food together for the day – all before Tony even wakes up! 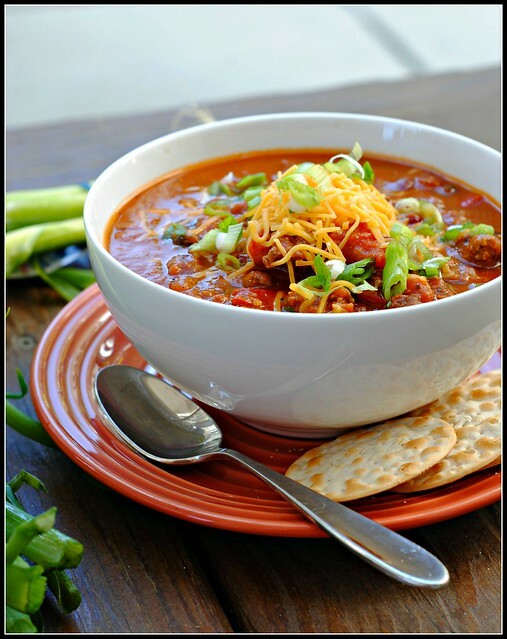 I’ll have to give this one a try – love the added pumpkin to the chili! I’m up at 5am and stand with you on the eye roll. Your blog cracked me up. Thanks for the giggle! Tis the season of pumpkin! This looks great! I am definitely not a morning person. It’s amazing that I get to work only 5-15 minutes late everyday. 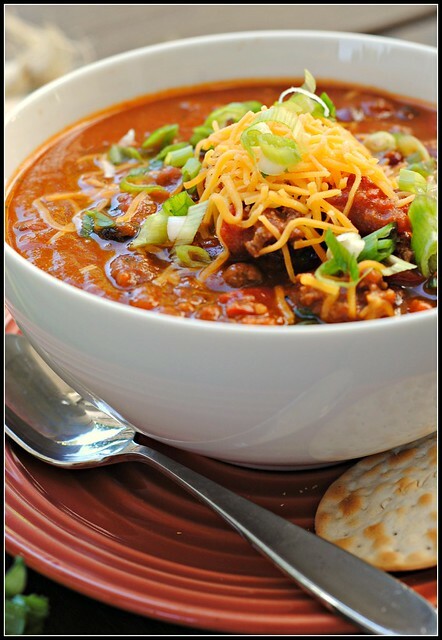 On the other hand, this chili looks amazing – so hearty and comforting! You and Mr. P crack me up! I just started living with Tony and I will say guys and girls are just so different. But I really can’t complain, he does so much around the house. This chili looks just delicious! My husband isn’t a morning person either – but I am. I’m awful in the evenings. This recipe looks delicious and I’m really intrigued by the addition of pumpkin! Could you please clarify– the tomato puree. Is that crushed tomatoes or tomato paste? I don’t know if I’ve ever seen tomato puree in the grocery store before. Thanks! Can’t wait to try this. Amelia, sorry for my delayed response…I’m having some computer issues this weekend. Tomato puree would just be crushed tomatoes, definitely not tomato paste 🙂 I hope that helps! Enjoy!! Not to worry! I took a guess and used just canned tomato sauce. The recipe is delicious! My husband and I both gobbled it up. The pumpkin lends itself well to a really creamy thick chili- without too much of a pumpkin taste. 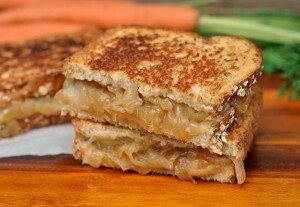 Also, usually cheddar cheese is a must when I have chili– this recipe didn’t need it at all. We will definitely be keeping this one and making it again. Thanks! This recipe looks amazing (love pumpkin and can’t wait to incorporate it into chili). Also, your post is hilarious! Our routine is similar in that I get up earlier also and we don’t talk (minus the dog) except that weekends he doesn’t want to get up either. Cute post! I was wondering if this could be made in a crockpot using low heat? 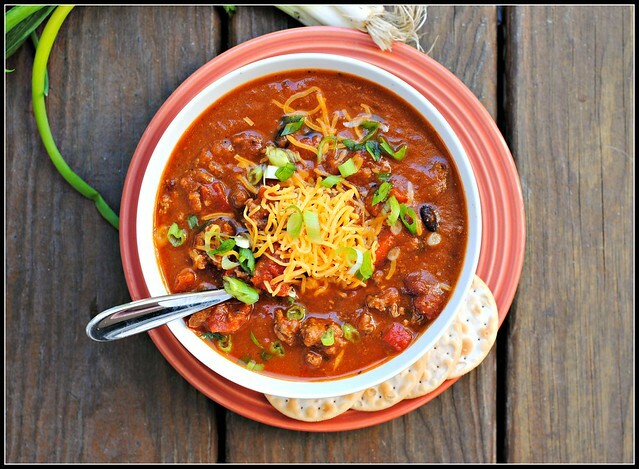 I love chili and would love to try this, but often don’t have the time to cook. I would sauté the onion and bell pepper as well as brown the meat before putting in the crockpot. Think 6-8 hours on low would work? Angela, I definitely think so. Add an additional 1/2 to 1 cup of chicken broth an I think it could go for that long, yep! 🙂 Enjoy! I have made this in a crock pot, and it is delicious. Usually I add in the beans during the last hour of cooking when I do so!